Their stone implements were always kept well sharpened, and after the day’s work was over the men sat around the fire and touched up their axes. They even chopped down great cedars with these rude tools and fashioned the war canoes with their aid. House and canoe builders did their heavy woodworking with stone-bladed adzes. The grooved blades were basalt, greenstone or jade, lashed to a handle made from a forked tree branch. 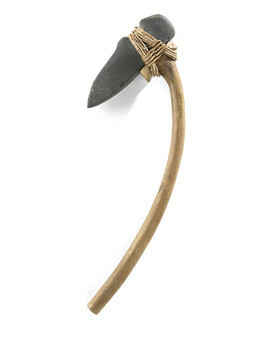 On great occasions such as a house-building potlatch, the host might carry an adze to symbolize the wealth he had achieved by building and trading canoes.